Your taste buds are sure to be satisfied with our range of breakfasts, lunches and tasty treats. Everything is freshly prepared on site using only the finest local ingredients wherever possible. We have a range of dairy and gluten free options for those who have special dietary requirements. We are a family friendly cafe, and children have enjoyed feeding our eels for almost 3 decades (and our eels love to be fed). We also a have large garden with lots of spaces to explore and activities to enjoy. This makes it the ideal place when the big people like to relax, while the little ones run off steam! 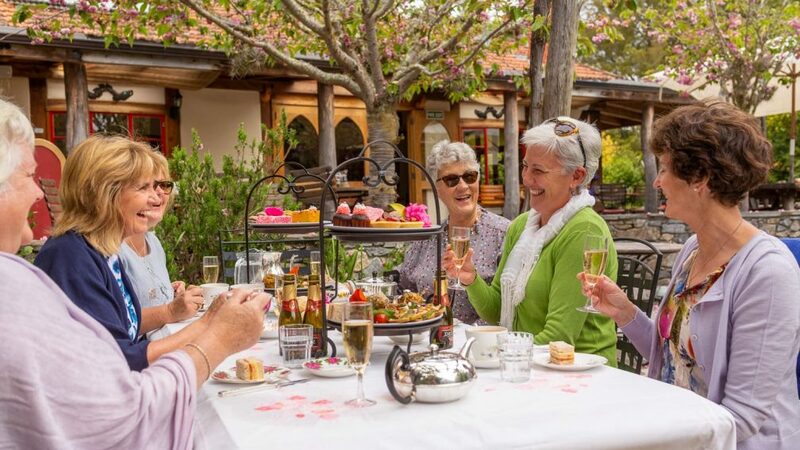 An afternoon tea experience that embraces traditional charm and style. Perfect for you to enjoy with your friends and family for any occasion. If you are looking for somewhere to host a party then look no further. We have set ‘party packages’ where we take care of the organization stress for you. We can even manage the cake if you need. 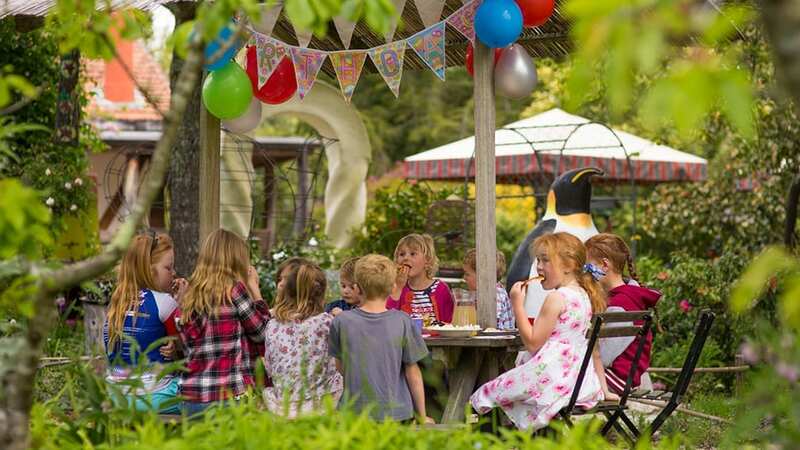 We don’t just cater for little kids, we can provide a venue for big kids too. Just let us know your needs. 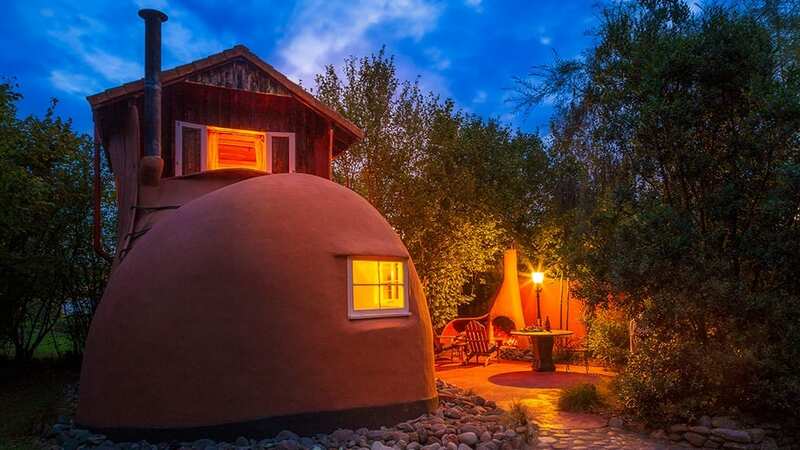 Inspired by the classic nursery rhyme, our Boot B&B offers a whimsical place to get away from it all. The Boot offers total privacy, and a truly unique experience. Guests also get to enjoy a fresh cooked breakfast from the cafe as part of their stay. – Catherine Smith, NZ Herald. We went to an evening of entertainment with a buffet offering two courses. The food was far better than I expected for a buffet and the staff were very friendly an very attentive for such a busy night. This is a wonderful location for lunch as well. The Jester house is one of the coolest cafes in Tasman. They have a bunch of games of the kids, great food, great service and great coffee. Located right on the great taste trail there is a stream running through the cafe grounds where you can even feed eels. This place is cool highly recommended! 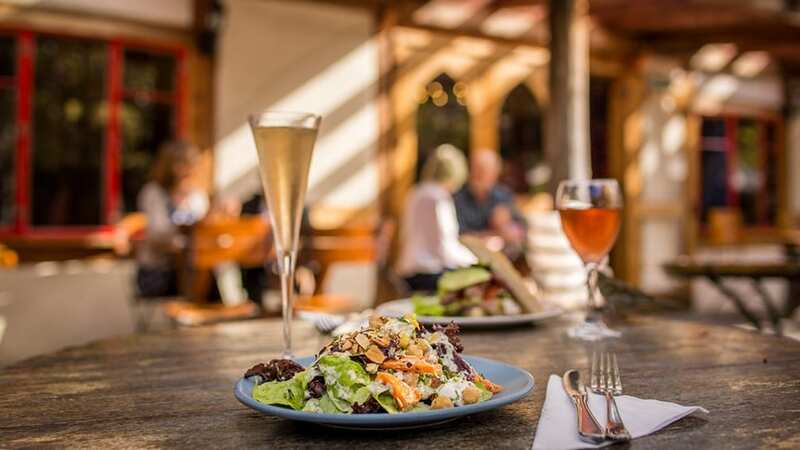 Charming garden surrounds, country-style setting, interesting menu, delicious food. Loved it so much visited twice during our too-brief holiday. We loved our visit to Jester House! The food was great and there was lots for the kids to do. Everyone loved their meals and the staff were fantastic! Our kids loved getting the eels too! We had the famous Jester House hash brown breakfast and it was fabulous. The wait staff are friendly and efficient and greet regulars like family. Highly recommend a magic place. A very pleasant couple of hours spent with friends. The staff were all very friendly and polite. I was delighted by the book swap. will drop some more in for you, the next time we are passing. Awesome. Always a great place to visit with the family and friends. Food was delicious! A local cafe that we visit often. Extremely charming place with excellent food and friendly staff. There's even a great little playground for the little ones. And feeding the eels is obviously amazing. If your in the area do yourself a favour and stop by! Here’s where you come for unique experiences. Feed the plentiful eels, wander through the garden surprises and even stay the night in a shoe. Yep that’s right a shoe! Or simple enjoy the cafe and country surroundings. Lovely cafe, good food, great space for the family. 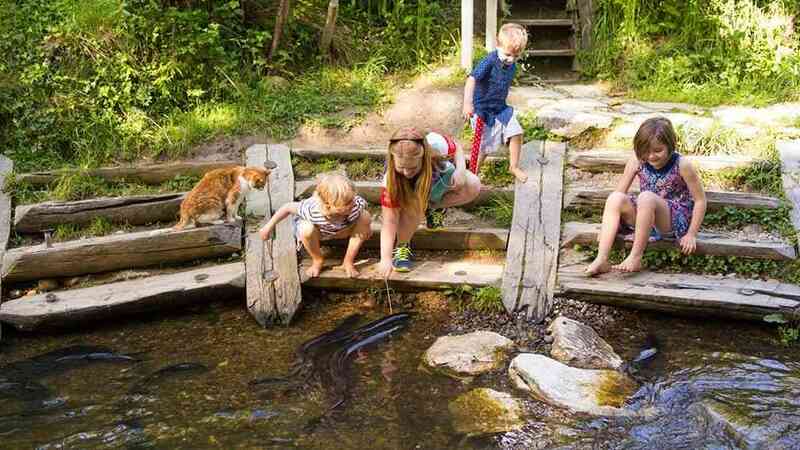 Feed the eels in summer, explore the cafe grounds for fun with the kids. Happy spot. Nice food in interesting surrounding. Suitable for all ages and a free meal on your birthday. Meet a happy 3 year old on his birthday. It's not just food but also a day out. The foods very organic and home grown you can taste the freshness. There is loads of thinking for young kids that keep them entertained for hours and eel feeding! Awesome awesome cafe with a difference. Love the composting toilet, unique garden and the eels. On the more conventional side the sandpit and playground is great. The food is delish. We pop in every time we are in nelson. Loads of fun for kids & adults. A very magical place. Feed the eels for $2 and remind your toddler NOT to eat the food (raw meat) provided for the eels! Ha ha. Excellent but because it is so popular sometimes the wait is lengthy! On a nice day a great outside setting...Family friendly & fun! Great place for food & coffee. Must do if you are in the area. Atmosphere, setting & service make it a place to visit. All good except spoiled by being charged an extra 50 cents for a cup of hot water, cold water makes my fillings painful. I had purchased a meal and coffee $ 27.00. Cold water is no charge and the only difference is the cost of heating a cup,of water, come on!I received a phone call to say they have reviewed and in future will not charge for hot water when coffee etc purchased, well done, so full marks on all counts. My brief stop at Jester Cafe was absolutely 5/5. I can see why this place was NZ Cafe of The Year once upon a time. The 'Sushi Bowl' was an inspired deconstruction and so fresh. Many thanks to the staff who accommodated my needs (ashtray, speedy meal). Beautiful surroundings, great food and service. Thank you!! !